In one of our recent posts we talked about some of the rousing successes we had at a couple different trade shows in 2013. Well, now that 2014 is here it’s time to hit the road, and we will once again be traveling the world to showcase the best of what Middleby’s got. So it’s time to hit the road! Make sure you have your passport ready and remember to put all of your pocket change in the security bin. First on tap is the Kitchen and Bath Industry (KBIS) Show Feb. 4-6 in Las Vegas. KBIS is the biggest show in the industry, and Middleby has some big things in store. All chefs are proud of their kitchen, from the person in charge of a 5-star resort or restaurant to someone who loves to spend their weekends cooking at home and throwing a Super Bowl party for their friends. Think about it…if kitchens weren’t such a big deal, why do most parties end up in one? Food brings people together, so why not go to the room with all of the good stuff? Kitchens are like a member of the family, and who doesn’t like to brag about a family member who is awesome? We’re excited about KBIS because it will mark the big reveal of over 50 new products from Viking Range. Between its product roll outs and the Viking Road Show trailer that will be criss-crossing the country starting in Miami Feb. 11, this is going to be a big year for Viking as they highlight the best new innovations in the industry. Also at KBIS will be TurboChef, which will be cooking live in the world’s fastest oven. 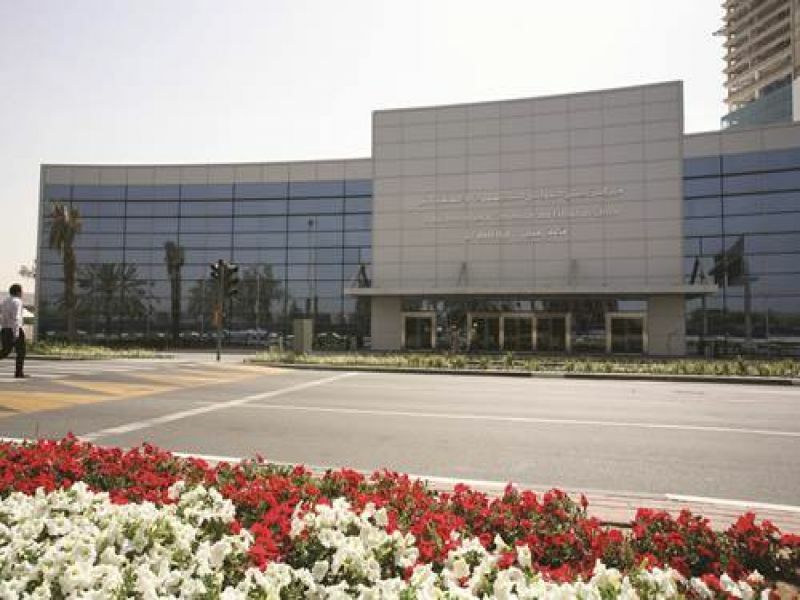 Once Vegas is in our rear-view mirror, Middleby embarks on a 7,000-mile flight to Dubai, United Arab Emirates, one of the more exotic locales in the Middle East, for the Gulfood 2014 show Feb. 23-27. Get ready to do some Lincat spotting (one of this blog’s favorite past-times) as Middleby’s UK-based brand will be there, along with Houno, Q90 and Britannia. Giga will showcase its 90-second oven by cooking great food live, as will Nieco, Middleby Marshall at Turbochef. Pitco and Perfect Fry will be showing its fryers in Dubai too. The first quarter of the year closes with a trip back to Las Vegas Mar. 24-27 for Pizza Expo 2014, a popular show featuring one of our favorite foods. While we are talking pie, did you know that 51 percent of Americans order out at least once a week, and 80 percent of the time they order a pizza? Of course, Middleby Marshall and the family of WOW! and conveyor ovens will be there, as will Beech Wood Fired Ovens, Blodgett Deck ovens, TurboChef Ventless conveyor ovens, and technology from Doyon pizza. The show is all about pizza, and it is all available under one really big roof. Which makes it a pretty awesome thing. Whew! Quite a couple of months, but we’re just getting started! Also on the calendar in the spring will be the Food and Hotel Asia show April 8-11 in Singapore, and of course the National Restaurant Association Show May 17-20 in Chicago. Finally, we get a home game! The year looks like it is shaping up to be an exciting one, hope you will join us at one of our shows in 2014! 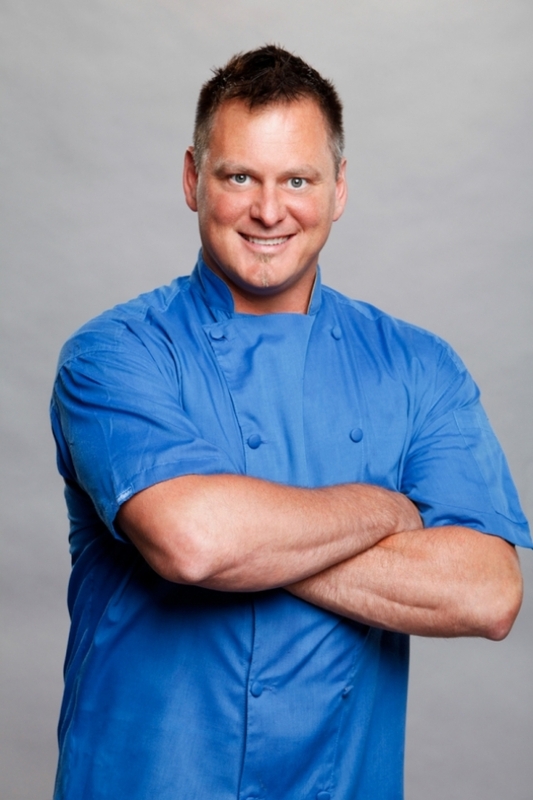 As a corporate chef for Blodgett, Joe Arvin is always on the go, administering cooking classes, hosting food trend seminars and contributing to menu and recipe development. In 2012 Chef Joe used his “Mad Love Cooking” skills to become a popular member of the Season 14 cast of the CBS reality show Big Brother. Chef Joe recently took time out from his busy schedule to sit down for a quick Q & A about his two favorite subjects…food and cooking! Middleby: What inspires your cooking? M: How did Big Brother help your career? CJA: Working on the show with CBS was a complete joyride. What most people do not know is that Big Brother has an average viewing audience of about six million and is shown in 23 countries. I had no idea just how well known I would become. Career-wise it opens doors when you’re known. You instantly have a voice and can use that voice for great things. M: Why do you describe your style in the kitchen as ‘Mad Love Cooking’? CJA: I have tons of passion! I absolutely love what I do, I tell everyone I meet and I’m loud about it. So loud that someone once said ‘is he mad or does he just love cooking that much?’ I say it’s just Mad Love Cooking! You could not pay me a penny and I would still be sharing my love for food with everyone I meet. M: Why do you like Blodgett equipment? CJA: Blodgett is a household name where I come from. The name is known for its sheer strength and dependability. We called ours the “Beast” in our first catering kitchen…I’m sure it was second hand and was well over 30 years old. Nowadays I love the new technology with the combi ovens. It allows you to cook everything BETTER, and I mean everything. M: If you had to pick just one, what’s your favorite Blodgett oven and why? CJA: They have an oven called the Hydrovection and man it’s awesome! Cooking with moist heat! BAM! It looks like my old Beast with a new modern touch controller. M: What is hydrovection and when would you use it? CJA: It lies perfectly in between a full-blown combi and a convection oven. I love to braise meats in it (because) it helps to retain its moisture and gives you better yields coming out of the oven. I will not be steaming root vegetables all day but it certainly can handle all moist heat applications. It is Perfect for school systems who dry-fry and re-therm the meals. M: Why should chefs use Blodgett? CJA: Chefs love to be known for being the star of the show! Why not have a star like Blodgett that you rely on to make darn sure you look good every time? M: Growing up did you have a mentor in the kitchen or someone you looked up to? CJA: For me it has always been my mom. It’s not every day you get to meet an angel! I knew for sure if I could have my heart like hers show on a plate, I would be forever good! CJA: We had a small French place in Kentucky called Laffite’s. I was head dishwasher and oyster shucker! You try shucking 500 oysters a day! You have to earn your stripes in this business. CJA: Jumbo lump Maryland blue crab with drawn clarified butter. I had never been outside of Kentucky when I decided to attend culinary school in Baltimore, Maryland! At age 18, my first bite was true love! The upcoming year is bound to be an exciting one for Viking Range. As Viking moves into 2014, its second year under the Middleby banner, the company is poised to unveil several new products full of innovative and game-changing designs that will be the centerpiece of homes for years to come. What better way to introduce some new products than to take them on the road! That’s exactly what Viking will be doing in 2014, as the Viking Roadshow will roll into Miami on January 28 for the first of more than 65 stops nationwide. After a wildly successful two-year run as a demo trailer for Blodgett, the trailer (and rig) have been getting a makeover and will soon arrive at Viking’s plant in Greenwood, Miss. When completed, it will be a great way for customers to see the new products and innovations through demonstrations that will be sure to help them become better chefs. 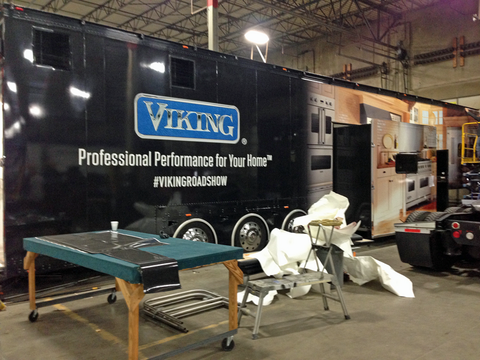 Also, keep track of the demo trailer via Twitter (@VikingRange) and keep an eye out for the hashtag #VIKINGROADSHOW. 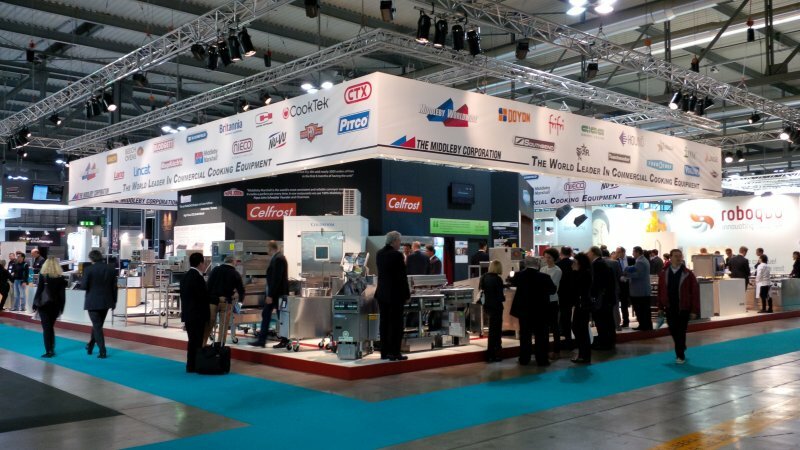 It’s been a great year for trade shows, and for Middleby 2013 marked our appearances at two of the bigger shows in the world – the NAFEM Show in Orlando in February, and HOST, held in mid-October in beautiful Milano, Italy. What makes these shows so important is that they are only held every two years, meaning if you want to make an impression, you have to do it now…or wait another 24 months before you get to try again. In Milano, we went all out to provide a great experience for our customers, and had one of the cooler-looking booths in our Pavilion. Of course we are biased, but see for yourself! Nice, huh? A very diverse representation of our brands were in attendance in Milan, including Middleby Marshall, Turbochef, Blodgett, Star, Nieco, Giga and Fri Fri. Making its first appearance at a show under the Middleby umbrella was Celfrost, the newest brand in the Middleby family after having been acquired on Oct. 15, just days before HOST. Based in India, Celfrost makes refrigeration equipment, and Middleby’s acquisition of Celfrost further expands our commercial presence in the growing market in the region. What made HOST really special was the rollout of Middleby University. Set inside the center of our booth, Middleby U gave potential customers the opportunity to see a special presentation of what selected Middleby brands are all about. The sessions were hosted by Doug Dunn of Middleby Worldwide, but representatives of each of the brands in attendance took turns in front of the class. Each presentation lasted about an hour, and provided a close-up look at our products and how we save our customers time, energy and money. 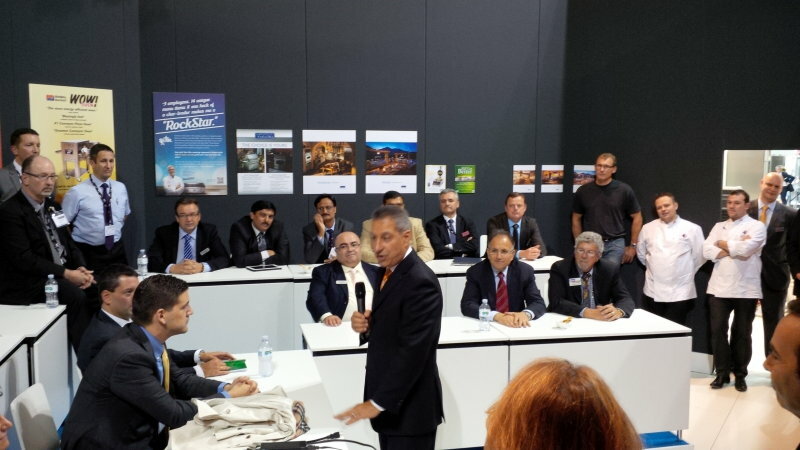 One of the more energetic presentations during the course of the show was when CEO Selim Bassoul stopped in during Tom Holmes’ Nieco presentation and put his own unique, high-energy touch to the proceedings. Mr. Bassoul’s leadership skills are undeniable, and those in attendance were no doubt left with a positive vibe about Middleby…once they caught their breaths, that is. As we prepare for our next big show in 2014, thanks to all of our employees, customers and visitors for helping to make our 2013 shows such a huge success. People love to dine outside, so it’s no surprise that for foodies summer is the peak of outdoor activities, especially when it comes to grilling. There are few things better than eating al fresco while munching on some great meat or veggies from the grill. Plus it’s a lot of fun. According to a poll by the Hearth, Patio and Barbeque Association (HPBA), 41 percent of consumers list one of the main reasons that they would buy a grill is because of the enjoyment of cooking outside. Restaurants are closely following consumer trends and see how much their customers love grilled foods and enjoy the outdoor dining experience, and Middleby brands MagiKitch’n and Viking have the perfect equipment. The new MagiKitch’n Outdoor Modular Cooking Suite (MKO) offers high production outdoor cooking for restaurants and clubs. It provides several options and accessories available to match diverse menu selections and operational needs. According to restaurant professionals and consumers, the top five attributes when purchasing a grill are easy to clean, simple to use, multi-functioning, portability of the grill, and add-on possibilities. MagiKitch’n and Viking meet these needs for both the commercial restaurant and home products. The MKO series offers all of these items that chefs love which make an unforgettable dining experience for their customers. The all stainless steel modular design features a grill, chrome griddle plate, and two 25,000 BTU side burners. Some additional add-on options are an adjustable warming rack, rotisserie and a steam option to name a few. But, if you wish to bring the outdoor restaurant style cooking to your home, Viking, the newest of the Middleby brands, can help make the dream come true. Viking Range has some outstanding residential outdoor products, whether for hosting the big summer party or just a few burgers with the family, Viking will exceed grilling expectations. Viking has an abundance of outdoor cooking pieces, including the popular 100/300/500 series grills, charcoal smoker, gas wok, warming drawer and double sided burner. Viking grills capture and create flavor as grill drippings become smoke atop the white briquette flavor generator system. Heavy-duty stainless steel grilling grates glamorize the grilling surface. Two halogen lights mounted inside of the grill canopy provide ample lighting for nighttime grilling. Reduce cook time with TruSear, eat sooner as short preheat time and intense infrared heat sizzles thick, juicy steaks, seafood, or vegetables to lock in flavor. Viking makes cleanup easy for operators once grilling is complete. Grease management system features “tray within a tray” design and burner drip guards aid in grease management by channeling liquid down to the drip tray. Research shows that Labor Day is the second most popular holiday for grilling, where 75% of grill owners fire up the grill. Whether you’re celebrating Labor Day, the upcoming tailgating season for football, or just relaxing with friends and family, don’t miss out on the opportunity to purchase a new Viking or MagiKitch’n outdoor grill that will have your guests coming back for more. Ready for the ultimate MagiKitch’n and Viking experience? Don’t wait, contact Matt Finke mfinke@VikingRange.com for all Viking Range questions and MagiKitch’n MKO Series details contact Steven Spittle: sspittle@pitco.com or (603) 230-5543. Lately we’ve been receiving (and posting) a lot of vintage photos, as well as photos of Middleby-brand equipment being used throughout the world. And judging by the amount of people who have viewed, liked on Facebook or re-Tweeted those photos, you all seem to enjoy seeing them. Of course, that means we will be happy to keep posting them, and if you have any you’d like to submit, send them along to us as well. Vintage photos are neat because they give us a quick snapshot of what life was like a long time ago. Notice the banner of this blog? It represents the beginnings of Middleby Marshall, and in fact features founder John Marshall, the man in the bow tie seated at the bottom right. Here’s the entire photo. Those photos bear testament to something Middleby and its more than 40 brands is all about — quality. That’s because quality is what keeps companies in business. Middleby Marshall would never have made it to its 125th anniversary – which it is celebrating this year – without a commitment to making quality a priority in everything they do. 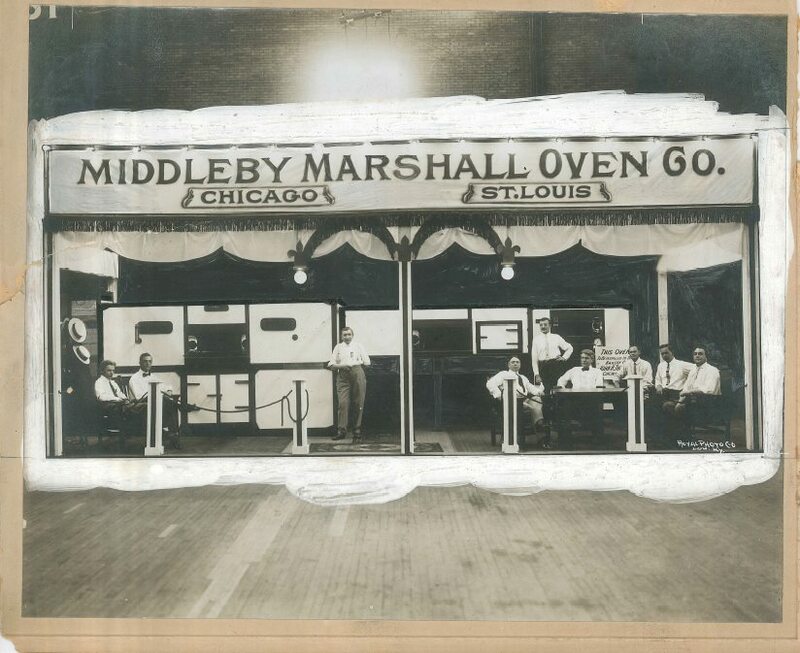 As crazy as it sounds, Middleby Marshall isn’t even the oldest business in our family. That distinction belongs to Blodgett, which has been cranking out ovens in Burlington, Vermont for 165 years. Wells has been around for over 90 years, and many of our other brands have the same kind of history. Many of our brands were started as small family businesses and grew to what they are today. One thing most family businesses have in common is that when your name is above the door you work that little bit extra to make sure your build a solid reputation that does that name proud. That attitude prevails even when a small family company makes the jump to a multi-million dollar corporation. It has to, it’s why the company got to where it is at, and it’s still what needs to be done to grow even bigger. Lincat, which has been in business since 1971, recently posted a magazine article about a fryer that had been in use in a UK bar for over 25 years. Imagine that…a fryer doing its thing day after day, year after year for over a quarter century, and the owner of the business said he had no plans to replace it, because it still works as well as the day he bought it. There are many of these kinds of stories out there from all of our brands…stories about our customer’s successes and the longevity of our equipment. We like hearing this stuff, and while we don’t mind it when people decide to replace an older piece of equipment with a newer model, we are proud of the job we did to create something that lasts. People’s businesses depend on products that last. That’s why it is important that when equipment leaves the plant it is ready for whatever a customer wants to throw its way. We want you to beat up our equipment, because our equipment can take it, and if you are beating up on our equipment it means that you are busy and your business is doing well! We are always happy to play a part in the success of our customers. Quality is why Middleby equipment sits in one of every three restaurants worldwide. Quality is also why we have such a high customer retention rate. We are proud of the relationship and loyalty we have built with our customers, both large and small, and how time after time they return to Middleby for their restaurant equipment needs. That loyalty and commitment goes both ways, as our guarantees and warranties are some of the best in the business. That also extends to our commitment to innovation, and our desire to improve products – and create new ones – that save you time, money and energy.